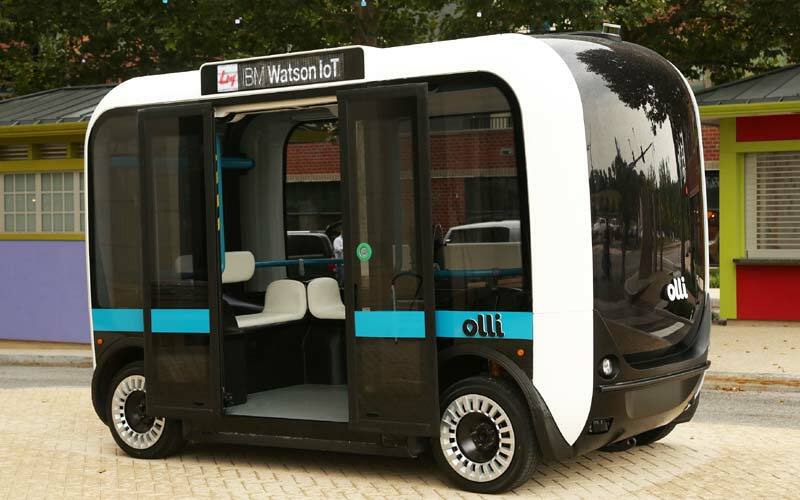 IBM-Watson powered Olli vehicle which is 3D printed and an fully electric. Olli, a 3D-printed electric vehicle powered by IBM’s Watson’s Internet of Things (IoT) for Automotive, has been unveiled by Local Motors, a company which has been creating and selling 3D printed cars. The vehicle, which can carry 12 people, is equipped with advanced vehicle technology, including IBM Watson Internet of Things (IoT) for Automotive, to improve the passenger experience and allow natural interaction with the vehicle. According to a press statement by Local Motors and IBM, Olli will be used on public roads locally in Washington DC, and late in 2016 in Miami-Dade County and Las Vegas. The press statement states Olli will use cloud-based cognitive computing capability of IBM Watson IoT to analyse and learn from high volumes of transportation data, and is fitted with more than 30 sensors, which will collect this data. Olli can seat 12 people. “Olli with Watson acts as our entry into the world of self-driving vehicles, something we’ve been quietly working on with our co-creative community for the past year. We are now ready to accelerate the adoption of this technology and apply it to nearly every vehicle in our current portfolio and those in the very near future. I’m thrilled to see what our open community will do with the latest in advanced vehicle technology,”, said John B. Rogers, Jr the co-founder and CEO of Local Motors in a press release. Olli leverages four Watson developer APIs — Speech to Text, Natural Language Classifier, Entity Extraction and Text to Speech — to enable interactions between the vehicle and passengers. Passengers will be able to talk to Olli while going from point A to point B, and also ask “why Olli is making specific driving decisions,” claims Local Motors. Questions like “Olli, can you take me downtown?” or “how does this feature work?” will be answered, including recommendations on local destinations such as popular restaurants or historical sites. “IBM is excited to work with Local Motors to infuse IBM Watson IoT cognitive computing capabilities into Olli, exploring the art of what’s possible in a world of self-driving vehicles and providing a unique, personalized experience for every passenger, while helping to revolutionise the future of transportation for years to come,” said Harriet Green, General Manager, IBM Watson Internet of Things, Commerce & Education. With self-driving, AI-powered vehicles being the new trend, looks like Watson-powered Olli is the latest on the list.